Millennials are the first fully digital generation: They haven’t had to adapt to technology — they were born into it. Not only are they completely comfortable using technology, they expect to be able to engage digitally with all of their personal and business connections, from friends and family to banks and doctors. Work interactions are no exception, including learning about and enrolling in their benefits. 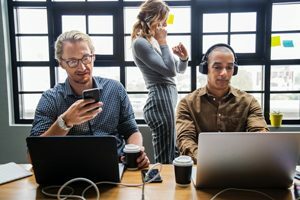 But the real reason millennial benefit and enrollment preferences matter tremendously is because when we talk about millennials, we’re really talking about the future of the workplace overall. They’re the largest generation in history and already comprise the largest share of the U.S. labor force at 56 million strong.1 And in many organizations, they’re not just the worker bees, they’re already the decision-makers. If you want to continue meeting the needs of your clients now and in the future, it’s worth the time to reconsider your strategy to make sure it hits the mark for millennials. Millennials may be tech-savvy, but they’re far from finance-savvy. One recent study2 showed a significant financial literacy gap between them and the U.S. adult population overall: American adults answered 50 percent of questions correctly, while only 44 percent of millennials could do so — and that number dropped still further, to only 41 percent, for younger millennials. Even more troubling — especially for the benefits business — is financial literacy among both younger and older millennials is lowest in the areas of comprehending risk and insuring, the study showed. Insurance in particular showed the biggest gap in financial literacy between older and younger millennials. This means a strong benefits education and communication strategy is essential to the success of your clients’ enrollments. So, what’s the best way to reach those employees? It’s true older workers are much more likely than younger workers to prefer printed materials to learn about their benefits, according to a new study commissioned by Colonial Life and Unum3: two to three times as likely if you compare employees over 50 years old with those between 18 and 34 years old. But here’s where it gets surprising: The younger workers are much more likely than their Gen X and Baby Boomer colleagues to prefer speaking to a benefits advisor in person or on the phone. In fact, more than a quarter of 18-to-24-year-olds and more than 30 percent of 25-to-34-year-olds cited this preference. That compares to just over 20 percent of the older workers. So much for the online-all-the-time rep millennials have been tagged with. One theory is this generation’s avid use of social media, where success hinges on likes and shares, indicates a stronger need for socialization of information and validation of opinions. Where better to ask questions about benefits than in a personal, individual one-to-one conversation with a benefits expert, where it’s all about you? You could consider it the ultimately selfie. Clearly, workers of all ages — but especially younger millennials — are crying out for a more simple, modern and personal way to understand and enroll in their benefits. You can help meet that need with the right mash-up of high-tech and high-touch tools and strategies. Remember, technology is never an end in itself: It’s simply an enabler that makes enrollment and ongoing benefits administration easier. Whether you conduct the enrollment yourself, use an enrollment firm or partner with a benefits provider that offers benefits communication and enrollment as part of its services, you’ll get better engagement if employees have the option to meet and talk with a benefits expert. Even if your clients use online tools for the actual enrollment, personal access to experts for questions and advice can drive stronger engagement and participation. You don’t have to be an expert in benefits communication and enrollment to pull this off. Take advantage of benefits partners with the expertise you need to round out both your portfolio and your toolkit. Look for a partner that can provide experienced, licensed, knowledgeable benefits counselors with high business quality scores (if your potential partner doesn’t track business quality or is reluctant to share this kind of information, keep looking).